Ogmund is a Nord and the resident bard (or as he puts it, "old skald") at the Silver-Blood Inn in Markarth. While most of his time is spent at the inn, he also spends some time at his home nearby. 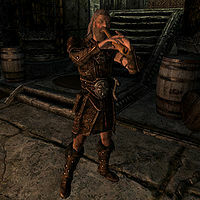 He claims to have been very influential among Skyrim's bards, as his styles and songs are still passed down by teachers to their students at the Bards College. He will perform The Age of Aggression (or The Age of Oppression if the Stormcloaks control the city), Tale of the Tongues or The Dragonborn Comes upon request. Also, he is an expert trainer in Speech. He leaves the Silver-Blood Inn around 8pm to head home and go to sleep. Ogmund wears a set of leather armor, including matching pairs of bracers and boots. He is equipped with an iron sword and an iron shield. He carries a key to his house and a selection of common loot and gold. This page was last modified on 12 April 2017, at 04:11.